A university worker killed his wife and then himself in a suspected murder-suicide, an inquest heard. The inquest heard Mrs Kemp, 31, had 28 knife wounds. Her husband apparently fell from a window of their Siloam Place flat and died. Suffolk’s area coroner was told Mr Kemp, 32, had a history of mental health issues and previously tried to “strangulate himself”. Jacqueline Devonish heard his mental health difficulties first came to light in 2016. Dr Michael McCullagh, senior partner at the couple’s GP surgery, said Mr Kemp was urgently referred to mental health services in 2017 after he threw himself on the surgery’s floor during an appointment. Mr Kemp said he felt it was “not worth being alive” and started to “strangulate himself”, Dr McCullagh said. Mental health worker Chantal Eoche-Duval said she assessed Mr Kemp after the “meltdown”. She said he told her he was “conscious about the size of his genitalia” and had been on the “receiving end of jokes and digs about it”. 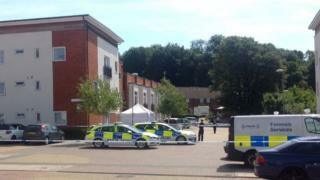 The hearing in Ipswich heard Mr Kemp was found covered in blood outside the communal entrance to the flats. Police forced entry and found Mrs Kemp’s body in a “pool of blood”, it was heard. Ms Devonish said Mrs Kemp had defensive injuries to her hands and “significant stab wounds”. The couple were both pronounced dead shortly after 09:30 BST. Mr Kemp’s father John said in a statement his son “thought the world of Katherine”. “They were so in love with each other,” he said.